MISSING DATA WARNING: Due to the missing data last month, we do not look at rental volumes in September. 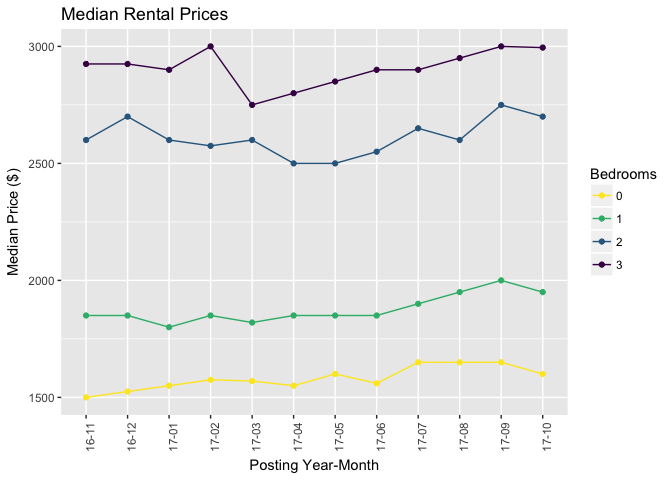 I do include September for the median price analysis though. First off, congratulations to Hector Bremner for winning the city by-election. He ran on a strong housing platform of increasing density across the city. Let's see if he can follow through. Gregor must be sweating at night thinking about next year's election. I have nothing against bike lanes, but this housing problem is getting ridiculous. Thankfully (?) the problem has gotten so bad that companies started complaining about loss of talent. That ought to light a fire under their butts. Speaking of winning elections based on housing policy, the NDP have drafted a much needed change to the yearly lease loophole. This change targets owners abusing a vacate clause in rental legislation to circumvent the maximum rental increase of inflation plus two percent. The exact number of directly affected tenants is unclear. However, its existence adds to the psychological angst of renting and encourages buying in this overvalued market. The people, especially folks on /r/vancouver, are getting impatient with the NDP. Personally, I'm waiting until February when the government delivers their full budget. I hope John Horgan knows that inaction on the housing file guarantees the NDP a spot on the opposition bench for another couple of decades. Finally, the OSFI's stress testing guidelines have been released. Everyone applying for a mortgage must be eligible under the contracted mortgage rate plus two percent or the five year benchmark rate, whichever is greater. Back of the envelope calculations show that this change will reduce a household's purchasing power by up to 18%. Predicting the future is tough, but I'll stick out my neck and say that this certainly won't help price appreciation. OK. Enough rambling. Onto the stats! We will compare against August because of the missing September data. The number of listings in October was robust. There were 4874 listings, close to our high water mark for the summer. Growth was very spikey however. Downtown listings grew by 12%, but the other major neighbhourhoods declined. 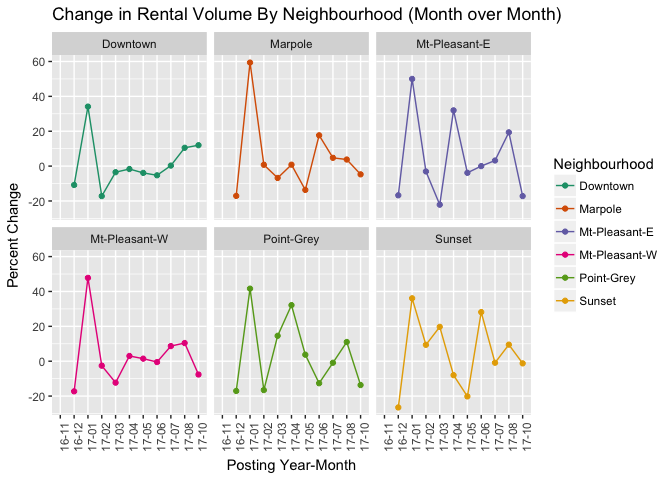 Mount Pleasant (East) actually saw a volume decline of 17%. My working theory is that students and summer visitors are leaving. Since visitors are overwhelmingly located in downtown, we would see volumes increase. The rest of the city is less affected by this trend, and would continue to see tightening. For the first time in a long time, we have price moderation. This would be consistent with the outflow of visitors in the more expensive core areas. Since these units are more pricey, the extra volume would cause landlords to ease up on their asking prices. 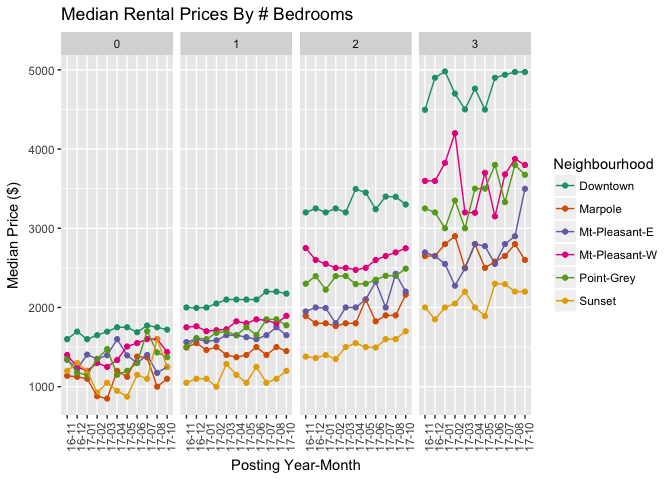 I heard some rumbling of having to lower rents on Twitter, but it's nice that our data confirms it. 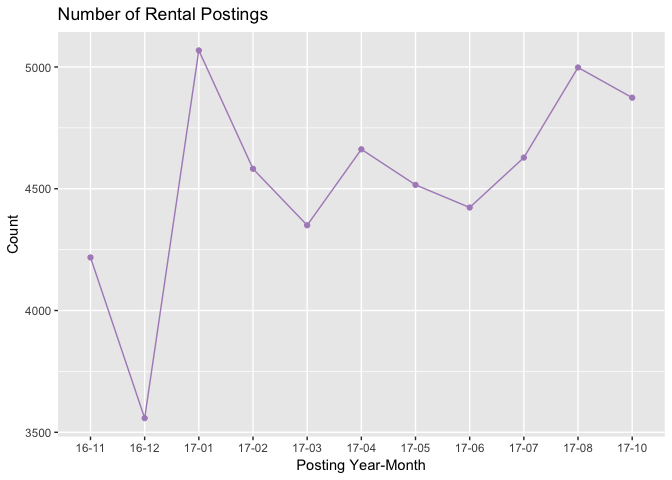 Looks like there isn't much pattern in the growth of listings within a month.